We specialize in providing Denver Airport To Golden Transportation Services via sedans town car SUVs or limos to and from DIA with our well maintained vehicles and experienced drivers at reasonable prices which no doubt comes with a 5 star treatment. You can be assured about the safety, courtesy and reliability of our services.For details or other queries please get in touch with us on (720)280-2895 where we will be able to assist you better or you can simply make Denver Airport To Golden reservations online! Express Colorado Transportation offer a more upscale experience including point to point service and reservations synced with your arrival and departure times. We put high priority in giving you an exemplary and personalized level of service.No matter your pick up and drop off locations may be we guarantee you get to your destination on time. Get personalized attention and a customized itinerary according to your needs.We understand how our customers have different and unique transportation requirements. Enjoy a private ride From/To the Ski Resort!Our limousine service will bring to you the best possible SUV, VAN or sedan executive to any specific locations.Our airport car service can make that possible for you. Here, at Express Colorado Transportation, for Denver Airport To Golden Transportation we guarantee first class luxury transportation from and to Denver International Airport along with other services, which runs from the Denver International Airport to Golden transportation . If you are thinking, “why Express Colorado Transportation?” we offer experienced, professional chauffeurs and better rates with high standard, clean ,luxurious and stylish cars . With years of experience, we have been providing professional transportation services from our first day in the business till now.You can simply relax and enjoy the ride by not having to face either the struggle of navigating Denver’s disturbing traffic or the hassle of finding a parking space at DIA! We have a wide range of vehicles you can choose from to travel in and around the city like the SUVs, sedans, vans or limousines. Among all of these, the most popular one is our Limousine service due to the true luxury and comfort that it provides while traveling. Whether you are on a tight schedule for a business meet or on a casual visit to Golden, the first thought after you reach the airport, would most probably be about how to reach your destination on time or whom to contact regarding the same. Express Colorado Transportation is your one stop solution to these concerns you might have.Especially if you are new traveler in town and unknown about the around to be taken, professional transportation services can be a good means of commuting in and around the city. We are available 24/7 for your traveling needs from Denver Airport To Golden Transfer . The Express Colorado Transportation Colorado offers transportation services at quite reasonable rates and our packages can even be customized as per the customer’s requirements. 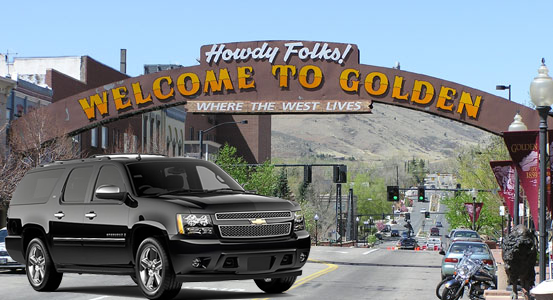 We can confidently claim that once you experience our hospitality, professionalism and quality services, you will never have to look for another service provider in reference to your Transportation From Denver to Golden Town car and shuttle needs! Enjoy the comfort of our limousines and business vans. Prepare for your next business meeting in peace, or let Express Colorado Transportation show you the highlights of the city. 2019 © EXPRESS COLORADO TRANSPORTATION Crafted with love by SiteOrigin.